Today I did a new install on my workstation at work going from Ubuntu 10.04 LTS to Ubuntu 12.04 LTS. 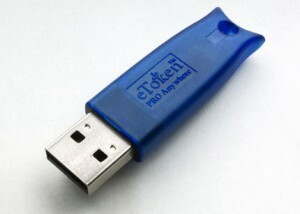 I am using a Aladdin eToken which comes with proprietary software. Because the previous version of the software was outdated and the documentation stated not to work on newer kernels I needed to install the latest SafeNet Client Authentication package to support this eToken. Because ‘/etc/ld.so.conf.d/wwwwetoken-ld.conf’ was empty the PKIMonitor program in the Ubuntu startup applications did not start at boot. I needed to add ‘/usr/lib/eToken’ to it. The new startup method for pcscd did not work for me. It is described on this page of the author. I commented out the exit 0 in ‘/etc/init.d/pcscd’ on line 43.